Turtles warm up in a pool at Sea Turtle Inc. recently on South Padre Island. SOUTH PADRE ISLAND — Green Atlantic sea turtles small and large will be returning to their natural home today. 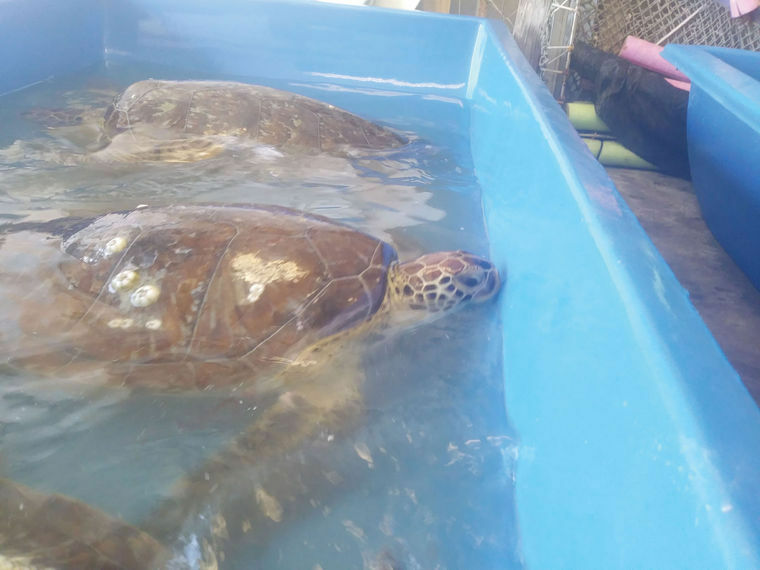 Saved by Sea Turtle Inc. earlier this week due to cold water temperatures in the Laguna Madre, the turtles are receiving a second chance. The recent temperature drop and snowfall caused water temperatures to fall drastically. “When this happens, sea turtles become vulnerable to hypothermia, and what we call cold stun,” said Sanjuana Zavala, Sea Turtle Inc. marketing director. The cold-stunned sea turtles were rescued by Sea Turtle Inc. personnel and taken to the facilities to warm up. Now that many of the saved turtles have been rehabilitated, they are ready to go back in the water. Spectators can join in this noon celebration release of these sea turtles at Isla Blanca Park between the jetties and the South pavilion.